When did you become money saving? I was quite good as a university student and stayed within my budget even though I only had paid work during the summer holidays. After leaving University, and moving back to Gloucestershire at five months pregnant, in order for Lee to start a teacher training course we really learnt the art of money saving. I was thrifty but kept it quite a secret. My friends were all earning money and living the life of young 20 somethings. In contrast Lee and I were renting a house, had a baby and Lee was a student. That year was financially tough and friends would ask me out and I literally counted out what I could spend as I didn’t want to say no. During this time I really learnt to spend less but live well. I think becoming a parent is an ideal time to look at how you can spend less. I have also noticed that there has been a huge turn of the tide and people are much happier to be more vocal about the fact that they bargain hunt now. 1. Use coupons for baby essentials. There are often nappy vouchers to be had in magazines and on websites. 2. Buy in bulk or buy three for twos. This especially applies to nappies, wipes and baby toiletries. 3. Join popular parenting websites as they often have exclusive offers. 4. I’d also recommend joining a review site like The Babywebsite where you pay £5 but are guaranteed to to review items that cost more. I was lucky and had things like a smart trike to review. Therefore I loved these ideas from last weeks linky on how to make your house into a home in thrifty ways. Do let me know just how frugal you have been this week by joining up with the linky. All posts recieve social shares and comments. Thanks for sharing my room tour post! Rachel recently posted…The Bee Good next Great British lip balm competition! I was brought up by my nan who lived through two wars in London so being frugal has always been a way of life for me. 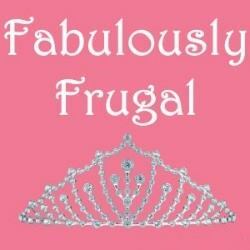 I tend to go through phases of being frugal although there is a general level of frugalness all the time. Think mine started as a student too. What some great ideas, I really need to get better at using coupons. I am terrible at having coupons and then forgetting to take them with me and use them. One thing I have started doing since becoming a parent though is buying in bulk. Not just baby essentials either. We buy everything in bulk except vegetables, fruit, milk and bread. I think that it’s really inspirational, your story to saving. I used to be great at uni but lost it a bit and now I’m trying to get back to budgeting! Kara recently posted…Fishy Fun One to One!